From the time of Spartan kings, to that of more contemporary military commanders, it has been noted that inspiration can only be delivered as the direct result of preparation, hard work and learning from the experience of failure. All famous leaders acknowledge the importance of these key elements and in order to learn from their experiences you need to accept this rule. Becoming familiar with the lives of inspirational leaders can help you get a better understanding of how overcoming failure can have a huge positive impact on the overall outcome of a situation. If you are able to understand why you have failed at something you become more able to make the necessary improvements and changes that create the ideal outcome. Without a grasp of the importance of this you remain focused on an aim that is difficult to achieve. 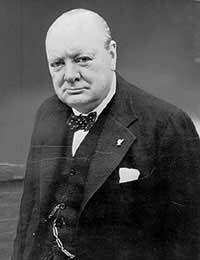 Winston Churchill’s quote “In Critical and baffling situations, it is always best to return to first principle and simple action”, is an excellent example of how using experience and reflection can be directed to inspire a fresh approach from a difficult situation. Accepting that there is nothing wrong with going back to the drawing board and simplifying matters will also help you make progress. The management tasks and structures that famous military leaders followed are complex processes, which had to take into account difficult decision-making situations. In this environment there is no room for trial and error in the decision process, and therefore crisis management needed to be handled with due care. Crisis management is the art of eliminating risk and uncertainty and can be applied to many everyday situations, both in the workplace and in our personal lives. In order to achieve the desired results you must learn to increase decision-making skills and responses. Being aware of limited time, resources and information will also be beneficial. In order to think like a leader therefore you must use knowledge, intuition, experience and an understanding of what is right and wrong. Famous military leaders understood that leadership is all about being and not simply just doing. The development of your own leadership skills should therefore focus on learning and managing, as well as developing a curiosity and understanding of the unknown. Leaders are people who challenge and create change. A good leader also knows how to motivate other people and how to adapt to each situation and experience. Military leaders like Dwight Eisenhower and Douglas MacArthur are recognised as having been transformational leaders. A transformational leader is shaped by their personal experiences, high moral standards and by enjoying a good balance of challenges and activities. Without this combination of personal skills and experience an individual’s ability to develop strong leadership skills may become more of a challenge. Reading biographies is a good way of dipping into the life and experiences of an inspiring leader. This type of information packed book will also provide a deeper insight into the minds of famous military leaders, as well as highlighting their personal challenges and expertise. By combining skills practice with quiet learning you will also be able to increase your own leadership potential.